Time to put your aprons on again and roll up your sleeves. We have more fabulous cake decorating tips and tricks for you. This time from New Hampshire baking extraordinaire, Wild Orchid Baking Company. Why do we love this do-it-yourself decorating trick so much? Well for one, it's incredibly easy, yet oh so stylish. Impressively enough Erin used a combination of colored fruit leathers to create these stunning cake flowers. This do-it-yourself project was beautifully captured by Mark Davidson. Read on to learn how to make your own cake flowers. Cake: Wild Orchid Baking Company Photography: Mark Davidson For complete instructions on how to make your own cake flowers read on. Perfect for decorating a cake or cupcakes. You an also use these cuties to dress up a fruit plate or garnish cake slices. Piece of foam Step One Using a round cookie cutter, cut circles out of the fruit leather. The size of the cutter you use will determine how large of a puff you have at the end. For these puffs we used round cutters that were 1/2” to 2” in diameter. Step Two Pick up a fruit leather round, and using your thumbs and forefingers, press the sides of the round together towards the center of the circle. You’ll end up with a shape resembling a ruffled “x”. Just be sure to press towards the center of the circle, so that you don’t close the “x” entirely. The open loops are what give the puff it’s shape. Repeat with other circles. For a nice full puff we used 6 fruit leather rounds per puff. You can use more or less depending on how full you’d like the puff to be. To begin to form a puff, press 2 of the ruffled fruit leather rounds together at their points. Step Three If the fruit leather has begun to dry out, brush on a small amount of water so that they stick together. Add more ruffles until you achieve the desired puff shape. Set formed puff onto a piece of styrofoam. Use floral wires or tooth picks to prop up the fruit leather puff into it’s desired shape. Allow to dry out over night. Using the wires or toothpicks helps keep the puff from drooping or loosing it’s shape as it dries. You may need to allow puffs to dry out longer depending on the humidity. Make The Small Circles Add dots to your cake or cupcake design by cutting out small circles from the leftover fruit leather. Apply using royal icing or water, just like the puffs. 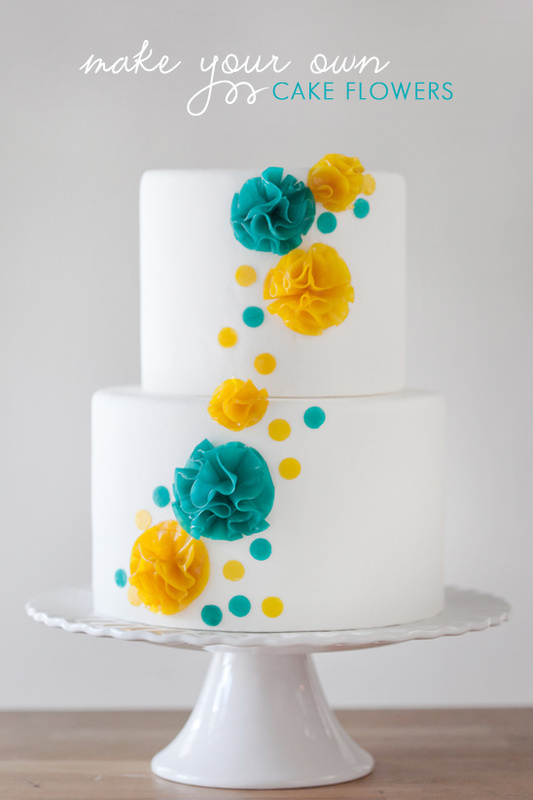 Apply to a finished cake using small dots of royal icing, or if applying to fondant just brush on a small amount of water where you’d like the puff to stick. For cupcakes: Set onto freshly piped frosting.